Alternatively, use git clone, or download the latest release from https://github.com/GinjaChris/pentmenu/releases , extract it and run the script. UDP Flood - much like the TCP SYN Flood but instead sends UDP packets to the specified host:port. Like the TCP SYN Flood function, hping3 is used but if it is not found, it attempts to use nmap-nping instead. All options are the same as TCP SYN Flood, except you can specify data to send in the UDP packets. Again, this is a good way to check switch/router throughput or to test VOIP systems. SSL DOS - uses OpenSSL to attempt to DOS a target host:port. It does this by opening many connections and causing the server to make expensive handshake calculations. This is not a pretty or elegant piece of code, do not expect it to stop immediately upon pressing 'Ctrl c', but it can be brutally effective. Slowloris - uses netcat to slowly send HTTP Headers to the target host:port with the intention of starving it of resources. This is effective against many, although not all, HTTP servers, provided the connections can be held open for long enough. Therefore this attack is only effective if the server does not limit the time available to send a complete HTTP request. Some implementations of this attack use clearly identifiable headers which is not the case here. The number of connections to open to the target is configurable. The interval between sending each header line is configurable, with the default being a random value between 5 and 15 seconds. The idea is to send headers slowly, but not so slow that the servers idle timeout closes the connection. The option to use SSL (SSL/TLS) is given, which requires stunnel. 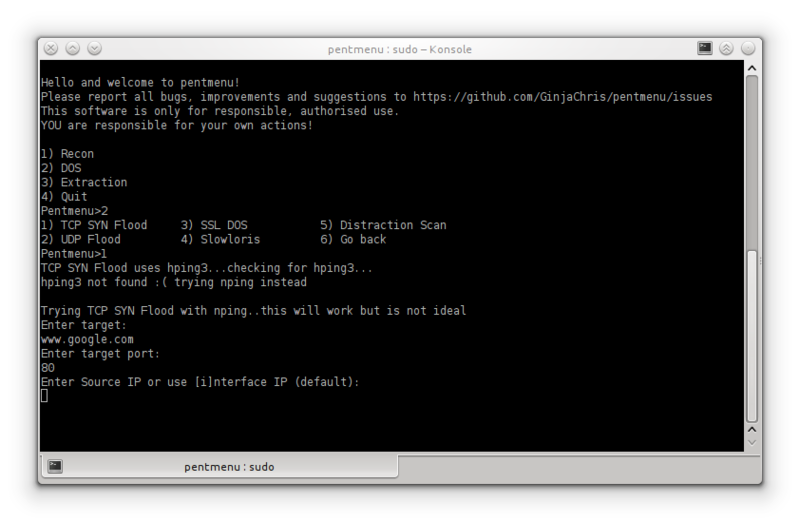 Pentmenu is available as a package on Arch Linux. Big love to ArchStrike and Parrot linux .